Once again the sewers at 17th and Folsom streets overflowed early Friday morning and there was some flooding at the shops and apartment houses in the area. 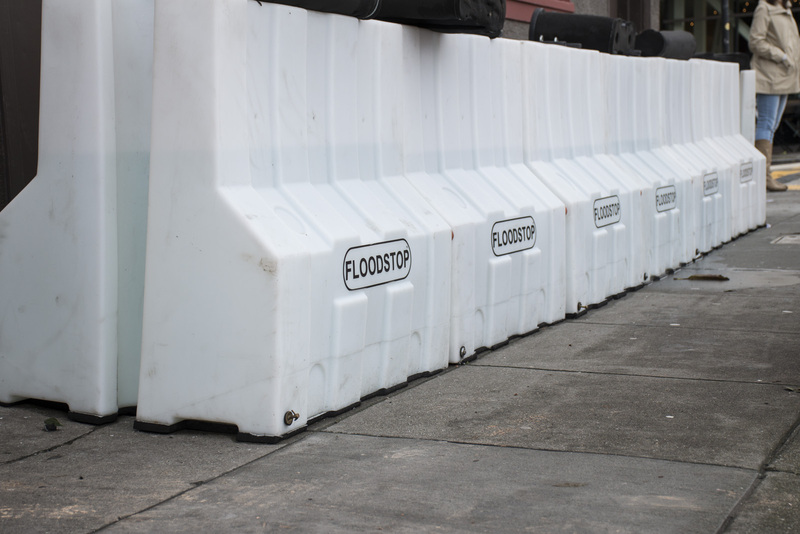 In response the city set up flood barriers, a reaction that at least one nearby businesses felt was ineffective and overkill. It is generally a downpour for more than 10 minutes that overwhelms the capacity of the sewers, he said. That happened early this morning, he suspected, with the 3 a.m. cloudburst. The area, he said, experienced flooding that was a mini-version of the 2014 storm that flooded virtually all of the businesses with sewage, closing some for months. The problem with the flood barriers, which the city set up today, is that you have to open and close them to get into businesses and if there is just one open, the barriers become ineffective, Art said. Instead, he said, he hopes the city follows through with its plan to fix what is essentially a really bad plumbing problem. It isn’t just the Mission that is getting hit by sewer flooding. Reports of damage are pouring in from all over town. The storm hit the same neighborhoods it always does: 17th & Folsom, Alemany at Folsom, Cayuga Ave in Mission Terrace, 15th Ave at Wawona, Ingleside Terrace.